In a Christmas past, I found myself searching house to house through a Baghdad neighborhood for hidden weapons and explosives being used by various insurgent groups to conduct a brutally violent civil war. As we were moving between houses, a single shot rang. One of my soldiers was knocked backwards by the impact of a high-powered sniper’s bullet. The soldier’s body armor stopped the round and saved his life. The round had hit the extreme edge of the ballistic plate. A quarter inch higher and it would have punctured his chest close to a number of vital organs. Within a few minutes, with a new armor plate insert and very bruised chest, this incredible soldier was again leading his men in operations. However, that Christmas morning his family erroneously received a call from an Army casualty notification team informing them that their son had been shot in the chest. We did not discover the error until the operation concluded several days later and the soldier was able to call him. In intervening days three more of my soldiers were nearly killed by a skilled, but very unlucky sniper. One soldier’s sleeve was ripped by near miss. A shot intended for another soldier’s head was stopped by a slab of bullet-proof glass. A third bullet actually entered another soldier’s helmet, grazed his head, and exited without causing harm. We were truly blessed that my unit’s Christmas Past so narrowly avoided deaths of serious injury, but the ghosts of such Christmases past spent so challenged continue to haunt our present. Since returning home, I have tried to stay in contact with many of the incredible men that I served with. Some of them are doing well. More of them remain haunted by the past in the form of brain damage from IED-caused traumatic brain injuries and from Posttraumatic Stress Disorder for the prolonged exposure to danger and violence we collectively experienced. In the last few months I have watched the hope for a merry Christmas Present of one of these soldiers vanishing. His wife was overwhelmed by caring for him and the rest of their family. And, frankly, people struggling with the effects of the invisible wounds of war are hard to live with. So he is alone, in pain, both physical and emotional, and dreading the reminders the Christmas season brings of all that he has lost as a consequence of serving his country for more than a decade. It is a scene too often repeated that tears at my heart. In spite of the hope this season brings, the prospects for Christmases Future are dim and discouraging. As we have repeatedly reported, the Department of Veterans Affairs, paralyzed by bureaucratic inertia, divided by competing interests, and anxious to avoid accountability for negligence and squandered billions, is unable to provide effective care for the roughly one-million veterans currently disabled by the invisible wounds of war. Many non-profit organizations allegedly dedicated to helping these veterans instead deliver large paychecks to their staffs, voluminous “educational” fund-raising material, and branded blankets, ball caps and backpacks. There is a lot of talk about hope, but little action to help. 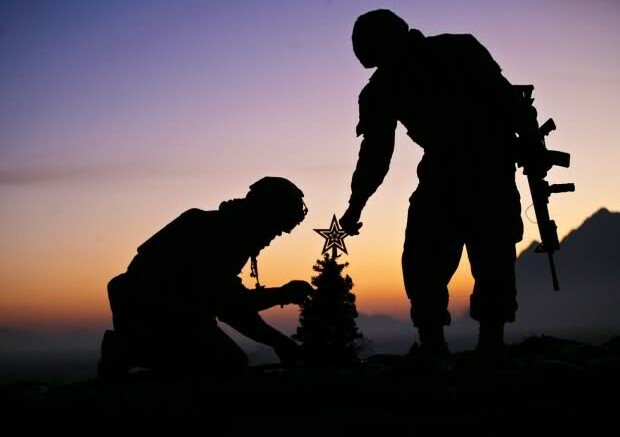 At Stand for the Troops, we believe strongly in the hope of Merry Christmases Future for the combat-disabled veterans struggling through this Christmas Present. Our world-class medical advisory board has identified a range of effective treatments based on an extensive and growing body of scientific evidence and clinical experience. We invite you to join us this Holiday Season in delivering a future of Merry Christmases to those who have given up their past and present Christmases for us.